Despite the rapid proliferation of social media in the last few years, email continues to be the preferred mode of communication for people to interact with brands that they love and follow. In fact, according to a recent research conducted by Marketing Sherpa, 60 percent of customers selected email as the most preferred communication method for receiving regular updates and promotions from brands they are doing business with. Furthermore, a Forrester research found that people are twice as likely to sign up for an email list as they are to interact with you on social media. And to further drive the point home, the ROI on email marketing is incredibly high. According to EmailMonday, for every $1 you spend on email marketing, you can expect an average return of $38. Judging from the stats above, it’s clear email marketing has more potential than any other channel, including social media and pay per click ads. Because small businesses have limited marketing budgets. And if you’re one of those small business owners, you probably need to make sure you’re investing your time and money on the right channel and tools. And one such email marketing tool is SendinBlue. Launched in 2012, SendinBlue is one of the new entrants in the email marketing service provider (ESP) space. Started as a digital agency, SendinBlue slowly evolved into an email marketing platform, catering mostly to small and medium-sized businesses. From pricing to features to support, everything is designed keeping growing businesses in mind. 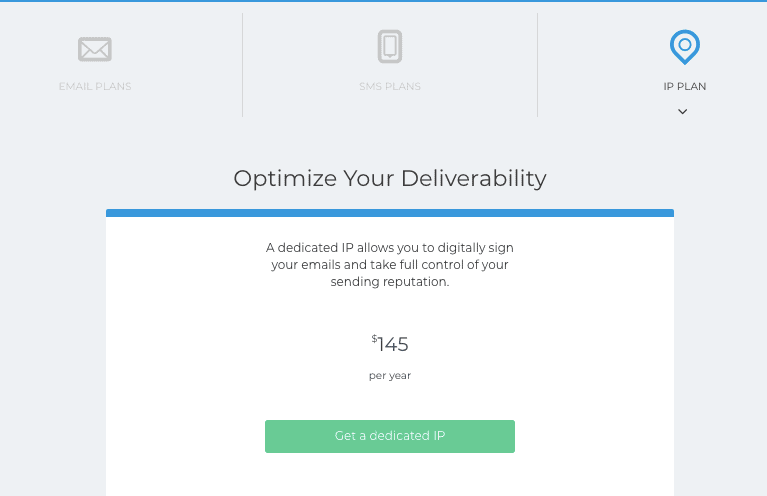 SendinBlue differentiates itself by offering affordable plans and a neat user interface that allows marketers to quickly create and optimize email campaigns, and measure their performance in real time. But how does it stack up against other ESPs in the market? Let’s find out! In this SendinBlue review, we’ll examine the tool’s key features, pricing, ease of use, customer support, overall sentiment around the product, and finally, help you decide whether this should be your preferred email marketing software. Not many ESPs believe in offering their platform for free. Luckily for us, SendinBlue is not one of them. The free plan allows you to have unlimited contacts in your email list. Unlike MailChimp (with inarguably the gold standard in free email marketing plans), there is no restriction to the number of contacts you can add in your email lists. However, there is a restriction on the number of emails (300) you can send in a day. A few users may find this number too small for their needs, and if you’re one of these users, you can upgrade to any of the paid plans. Aside from the daily email send limit, there are very few restrictions with the SendinBlue free plan. You get access to advanced features such as marketing automation, contact management, real-time reporting, and more. All the paid plans have monthly sending limits, but no limits on the number of emails you can send in a day. 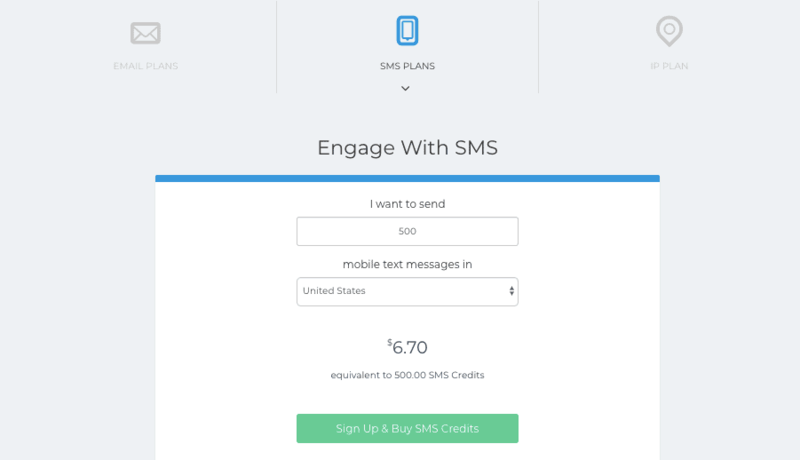 SendinBlue charges a fixed rate for their SMS plans. It’s up to you to figure out the number of SMSes you’d like to send, select the currency, and then wait for SendinBlue to calculate and display the price. So if you’d like to send 500 text messages and select USD as the currency, you’ll have to pay $6.70. If you choose the SendinBlue Enterprise plan, you get a free dedicated IP. But for all other plans, you’ll need to buy it separately for $145 per year. With a dedicated IP, you can use your domain name and your own digital signature and have full control over your sending reputation. SendinBlue has a neatly designed blue and white user interface. The dashboard displays total number of email contacts along with key stats such as the average open rate and clickthrough rate (CTR) of your email campaigns, and the number of contacts you’ve blacklisted. Below these stats, you can view your previous email and SMS campaigns, as well as shortcuts to creating new campaigns. If this is the first email marketing software you’re using, you’ll find it easy to create and ramp up your email campaigns and even learn advanced features such as automation in a short time. Overall, it’s an extremely user-friendly email software with a flat learning curve. Now let’s take a look at some of the key features of SendinBlue. 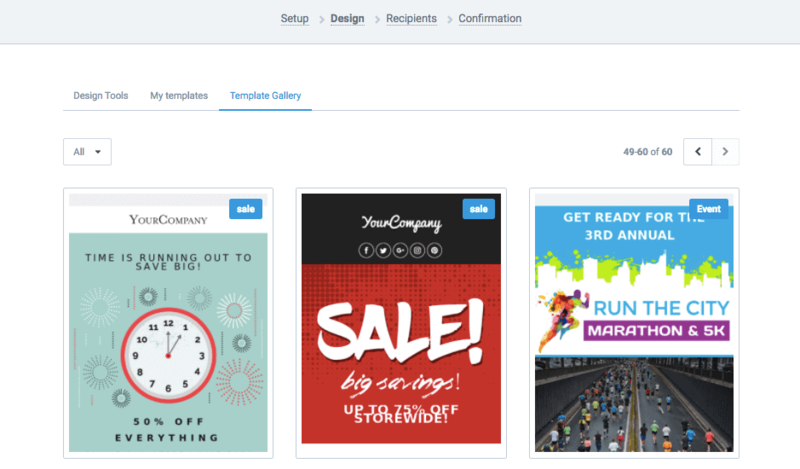 Email Designer – With SendinBlue’s drag and drop designer, you can design and customize email templates without any design skills. You can choose any of the predesigned templates to customize or you could create a template from scratch. Contact Forms – The contact forms are easy to create and customize, though there are no predesigned templates. Contact Management – You can use SendinBlue’s advanced search criteria to sort, filter and segment contacts for perfectly targeted campaigns or group your contacts into folders and lists for quick and easy organization. Campaign Reports in Real Time – SendinBlue lets you watch live campaign results in your dashboard. You can also export in-depth campaign reports in PDF or CSV formats. Marketing Automation – With SendinBlue’s automation workflow designer, you can easily create multi-step, multi-channel campaigns with unlimited variables in a matter of minutes. 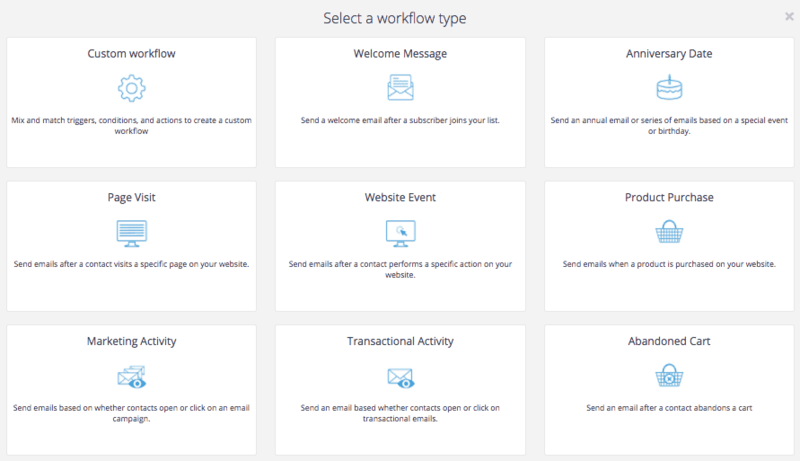 The email automation and workflow designer features are included in all plans, including the free plan. SendinBlue Integrations – SendinBlue integrates smoothly with WordPress, Shopify, Google Analytics, Zapier, Sumo, OptinMonster, and tons of other software and services. SendinBlue offers an extensive resources page where you can find answers to most of the problems you’ll run into. In case you’re not able to find a helpful answer, you can create and submit a new ticket. You can also submit general questions through this form. In addition to these options, SendinBlue also offers phone and chat support for all users, including those under the free plan. The SendinBlue team also updates their blog on a regular basis. 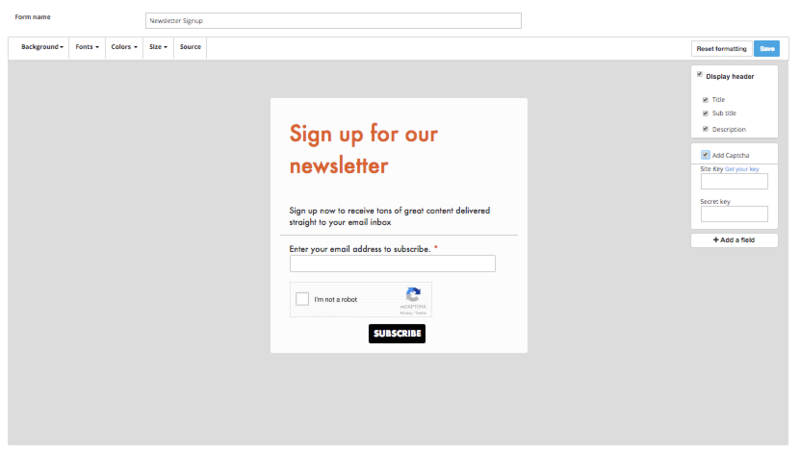 You can subscribe for their email updates to stay up-to-date with the latest features and functionalities, and also learn a few email marketing tricks. SendinBlue is used by over 50,000 businesses worldwide and you can find a few glowing reviews from these customers on their home page. The email software has also been able to garner decent ratings on popular review sites. Some of the positive comments include the affordability of the service compared to its peers, easy to use drag-and-drop email template builder, and the excellent customer support. Amidst many positive feedback and comments, there are a few negative ones as well. Some users have criticized the limitations of the free plan, deliverability issues, and lack of a landing page builder. SendinBlue faces stiff competition ahead in the ESP space with old veterans such as MailChimp and AWeber dominating the industry and new entrants like ConvertKit offering advanced automation features. Having said that, SendinBlue has been able to create its own unique identity in the space with its cost effective email plans as well as the ability to add new features. 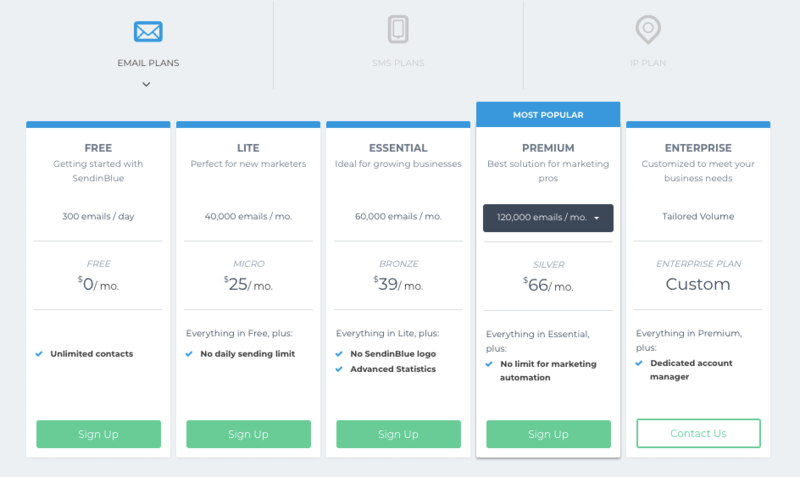 Small business owners, solopreneurs, and bloggers will see value in this tool and with the free plan available, there is no reason not to take SendinBlue for a test drive and see if it meet your current needs. What are your thoughts on SendinBlue? Have you used this email software before? Let us know in comments section below. SendinBlue has been able to create its own unique identity in the space with its cost effective email plans as well as the ability to add new features. Small business owners, solopreneurs, and bloggers will see value in this tool and with the free plan available, there is no reason not to take SendinBlue for a test drive and see if it meet your current needs. From my personal view, for a small business, limited free plan with no ability to build landing pages even with paid plan are big downsides. As a small business, you want to save as much as possible, using as little as possible.